We take for granted that library books should not be written in, altered, and tracked with barcodes (if we let them out of the library at all). But before the invention of modern security measures, or even of circulating libraries themselves, book owners went to great lengths to protect their libraries from coming to harm. Medieval and early modern books were chained to benches, locked in chests, and even inscribed with curses to deter potential thieves from making off with them. Yet despite appearances, these books were intended to be shared and read by many, and to change hands carefully, if not frequently. Aside from theft, we also go to great lengths to prevent books from deteriorating due to use. One of the best steps we can take after repairing a book is to put it in a box, protecting its covers from scratching or wearing, and preventing the heavy text blocks of large books from pulling out of their bindings. Opening one of these boxes is always a bit of a surprise, and this small box marked “The Iliad of Homer” was a pleasant one. 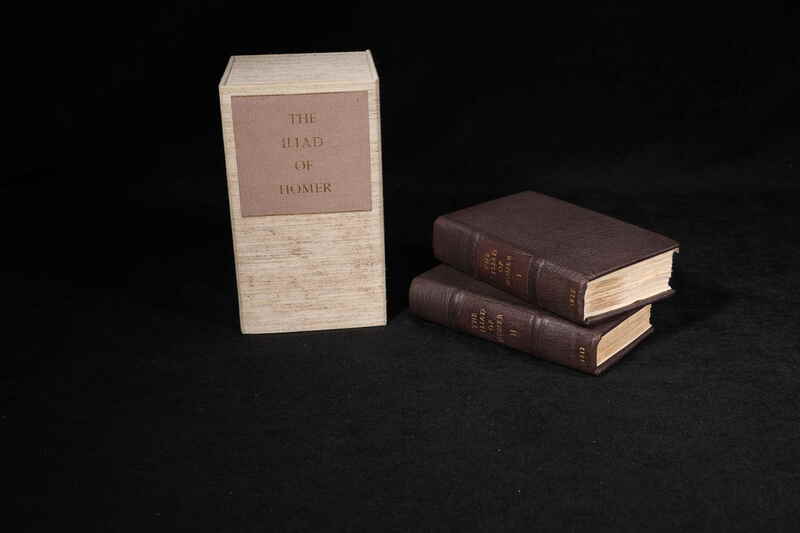 This small format, two volume English translation of Homer’s Iliad (by Alexander Pope) is a local book. 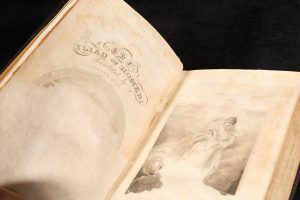 It was produced by the Philadelphia printers William Fry and Joseph Kammerer, but published in Baltimore and New York in 1812. What drew my attention, though, was the glimpse of a longer “library history” preserved in this verse on its front flyleaves. Enjoy each sweet, and not abuse them. Think of me, and please return them. Fortunately for me, owner’s full name and date follows on the title page. William P. Miller, Baltimore, 1850. 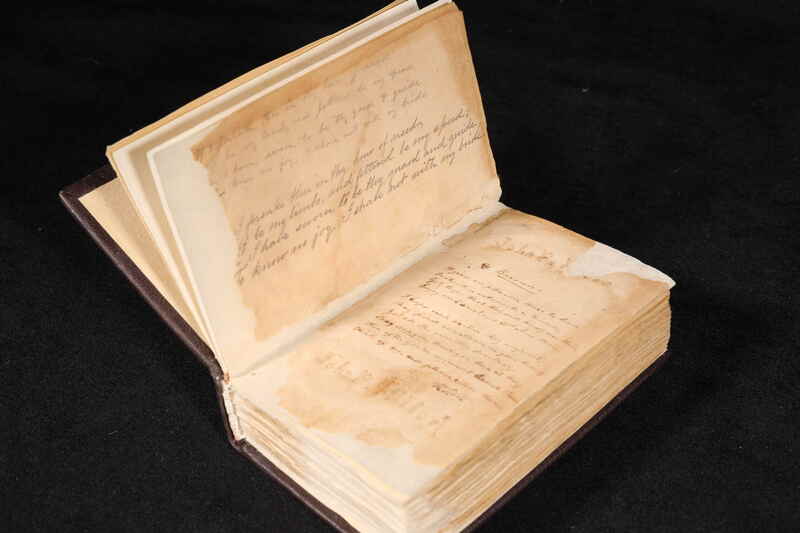 The book also bears the inscription of a family member, John P. Miller. Unfortunately, Miller is an extremely common name—contemporary Baltimore directories list dozens of “William Millers”—so his exact identity remains unknown. At this time, the only libraries in Baltimore were private collections (the first public, but non-circulating library, the George Peabody Library, was still seven years from its foundation). But as in centuries before, books circulated among groups of friends, especially when copies could be scarce. Sharing a small, locally printed book like this (as opposed to the first edition of the Alexander Pope’s translation of the Iliad, a seven-year effort which first appeared in six parts to subscribers only) carried less risk to Miller had a borrower not taken his advice, but still would have been an act of generosity, as he says, a risk worth taking for his friends. 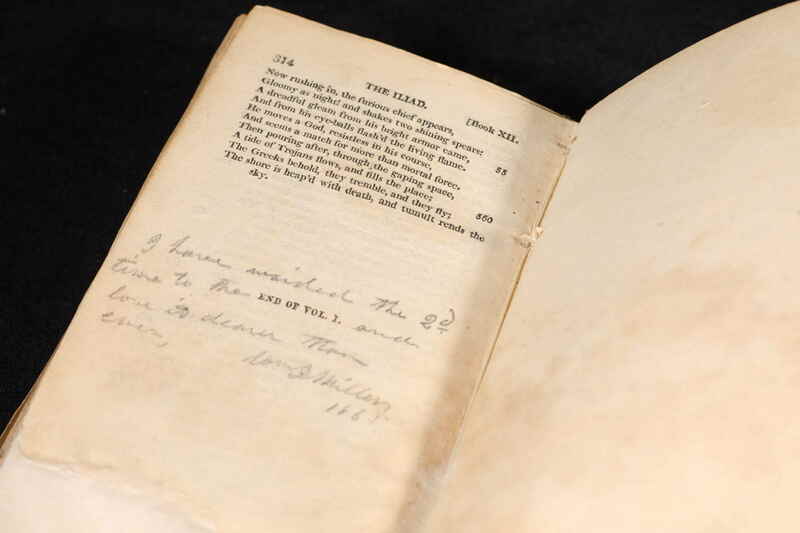 The first inscription wasn’t the only thing that Miller left to posterity through its pages. Underlining in pencil the throughout the volume centers around decisive moments and noteworthy passages – “instructive virtues” that Miller hoped to impart. 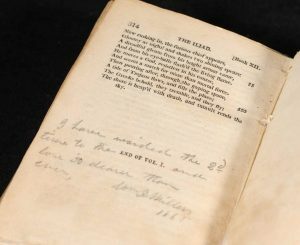 At the end of the first volume, Miller leaves another note, this one dated 1865, informing us that the book was as good the second time as it was the first. 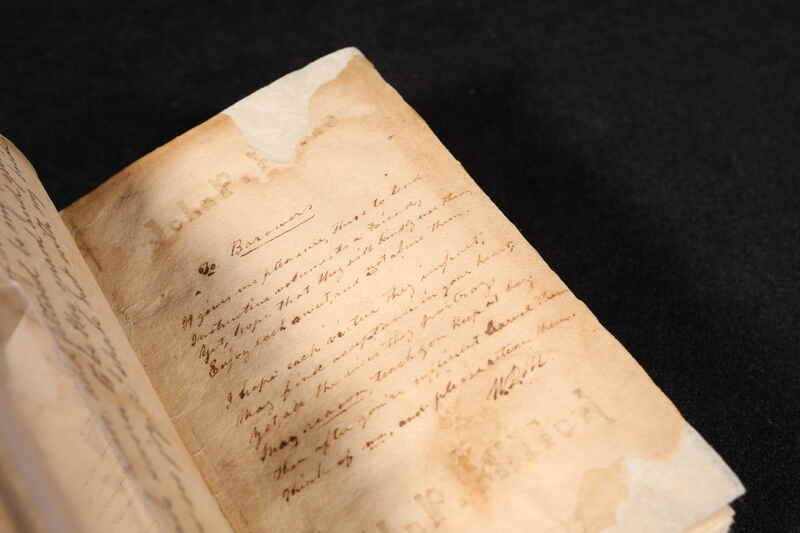 However, on the rear flyleaf, another penciled couplet signed and dated by Miller suggests that his second reading might have been brought on by less joyful circumstances. Miller’s inscription reads: “The time will come, when we will blush to tell / And curse the fields, on which our brothers fell” [Balt]imore, MD, 1864. In Miller’s case, Homer’s epic verses on the fall of Troy could be cherished both as a model of heroic virtue and as a poignant reflection upon the losses that came with it. The bloody conflict of the Civil War, and Maryland’s place in it, likely gave new resonances to the scenes of Achilles’ grief over the loss of his comrade Patroclus, or the downfall of Priam’s family along with his city. These impulses drove Miller not only to return to the pages of his book but also to document his presence in it, leaving traces that would be seen by borrowers and later owners alike. The transition from private to institutional library came through a Hopkins librarian and alumnus, J. Louis Kuethe, who donated the book to Hopkins in 1936. Although the original bindings on the volumes were replaced, one set, preserved along with the copy in the box, bears a bookplate recording the gift. 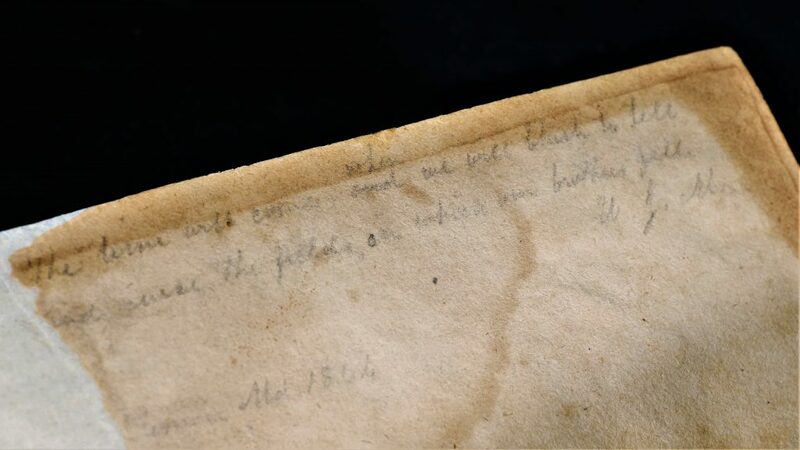 Opposite Miller’s poem to borrowers on the front flyleaf, a later hand which is possibly Kuethe’s has copied out a transcription of another poem which appears to be from Miller to his (also unnamed) wife. Keuthe, who spent over forty years at Hopkins as an undergraduate and then as assistant Librarian, assured that the Library would provide Miller’s book with ever more borrowers. Studying the history of annotation in books allows us to catch small, often fragmentary glimpses of their uses across time and place. It’s rare, but not unheard of, to encounter readers like Miller, who provide so much information about when and why they read. When they do, however, they remind us that there is often much more to encountering, and sharing, a book than simply accessing its text. All carry pieces of stories, moments from books, in our minds, and every so often we leave pieces of ourselves in them as well. Paper repairs stabilize the remains of the portrait of Alexander Pope and the engraved frontispiece following the title. We’ve come a long way from chaining them to benches or locking them in chests, and we’re lucky to have an excellent and talented group of conservators working in the library if a book ever gets in seriously bad shape. Before being boxed and rebound, the pages of these little volumes sustained heavy damage (possibly due to water) and have been meticulously repaired and strengthened, so that both its text, and its handwritten additions, can still be read. You can’t come into Special Collections and ask for a book in a box, but if you ever do encounter one in our reading room, know that that book has had some extra (and recent) chapters added to its story to keep it in its current state. And no, sorry, you can’t follow the advice of this previous owner and take it home with you. The front flyleaves of volume 1, with two poems in the hand of William Miller, along with a later transcription, possibly in the hand of Kuethe.